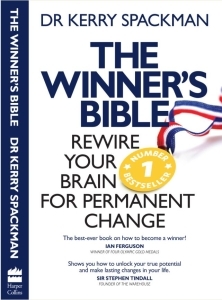 The Number 1 Bestselling book which helps you to “Rewire your Brain” for permanent change. Based on Kerry’s highly successful work with Olympic Gold Medallists, Formula 1 Champions, Drug Addicts, and Business people – Kerry shows why most ‘Self Help’ Books don’t work and why you need to use “Tools” rather than follow “Rules” to succeed in all aspects of life. In a truly heroic journey, the movie charts Albert Einstein’s life, his battles over enormous obstacles to rise from obscurity to become the most famous and recognisable man ever. While the 20th Century was packed with extraordinary people who left their mark on society, Albert Einstein soared far above all and to this day he continues to change the lives of every person. Dr Kerry Spackman takes on the biggest questions that have puzzled mankind and answers them in his engaging and easily accessible manner. A genuinely uplifting book that will almost certainly change your own beliefs. Learn how to master Philosophical tools that allow you to look beyond your natural human limitations and see the hidden Fabric of Reality with new eyes.